Women’s Basketball Pink Zone game for Breast Cancer Awareness! Lots and lots of pink. From left to right: Jesse Adams '12, Doug Sprankling '10, cute pink balloon, Mia Tsui '11. Photo by Jacquelyn Nestor '12. Snow day! The band plays in the snow. Basketball against Yale at Jadwin Gym. Victory of 82-58. Emily Moder '13. Picture by Jacquelyn Nestor '12. Stephen Tuozzolo '12. Picture also by Jacquelyn Nestor '12. Tallahassee. Woohoo! Here we played for the Women’s Basketball team in the NCAA tournament. Photo by Jacquelyn Nestor ’12. Left to right. Top: Lucy Reeder '12, Doug Sprankling '10, Michael Bishop '13. Bottom: Kenrick Rilee '13, Rachel Thorman '11, Alec Slatky '12, Matthew Edwards '12, Gaby Stember-Young WCC, Evan Leichter '13. The Band took an awesome trip to the new Meadowlands Stadium for the Konica Minolta Big City Classic. We played Syracuse… we lost… but it was awesome nonetheless! And the Band went undefeated. Kristen Davila '11 in the kilt, Mia Tsui '11 in the whitecoat, Rachel Sverdlove '11 with the mace. Photo by our own Hyung Lee '12. One word. Reunions. I hope to see each and every one of you there this year. It’s going to be great! Heading to Poe Field. Photo courtesy of David Zaslavsky '08. Graduation gives us some new cool alumni! Here they are at the P-Rade, with their plaided jackets and everything. We love our 2010 seniors! From left to right, Andrew Weintraub, David Casazza, Josephine Walker, Doug Sprankling, Julianne Grasso, Mark Cerqueira, and Will Kain '11. Photo by David Zaslavsky '08. NEW FRESHMEN. They are awesome! Some of our new members! Top left to right: Dillon Reisman '14, Bonnie Eisenman '14, Chris Warwick '11. Bottom left to right: Wendy Pan '14, Buse Aktas '14, Peyton Morgan '14, Matt Kirschner '14. Picture courtesy of Wendy Pan '14. And now we have a steel drum player; she is great! We love having new additions to our ever-awesome Garbussion section! A ghost in Greenwich Village.... woooo..... (ghost noises)..... woooo..... Abby Bowman '11. Photo by Alison Lee '13. Check out the photos from these links! The Band was popular among the paparazzi at this event. We went to Yale! Another picture from Jacquelyn Nestor ’12, this one featuring some of our alumni! For those of you that don't know them (ahem freshmen pay attention): Left to right we have RW Enoch (RW) '09, Jeff Bagdis (Bagdis) '08, David Zaslavsky (Zaslav) '08, Joel Thompson '08, Lucas Giron '09, and a 'photobomb' by Anna Condella '12. Caroling! Santa was in attendance. Mr. Santa Claus. Photo by Nicole Rafidi '12. 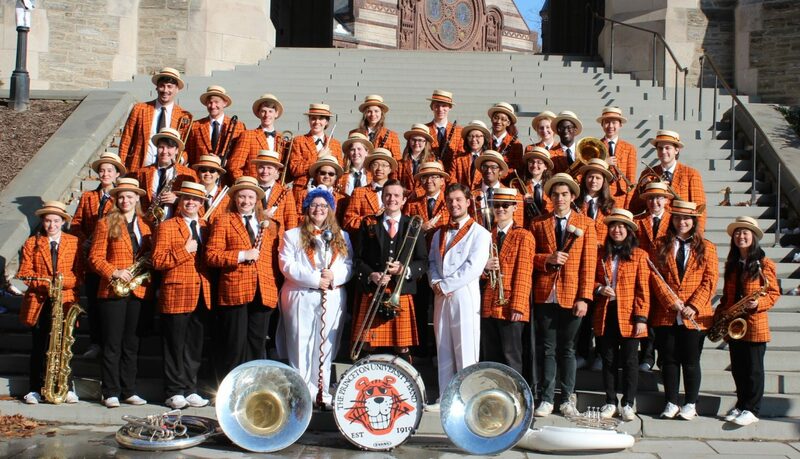 Happy New Year from Santa, and from all of us here at the Princeton University Band. Santa Claus in full uniform. Photo credit to Gaby Stember-Young WCC. Previous PostPrevious Football Season 2010! Next PostNext Dean’s Date 2011! And some games too.